Historically, a mechanical gear pump has received its pressure through a hydraulic operated press brake that would bring oil to the machines pistons. Although this process contains a few benefits, there are also some disadvantages that come along with it. For instance, a hydraulic press brake will repeatedly maintain its power regardless of whether or not the machine is actually moving. Additionally, these can be relatively loud and can create extreme shaking within the machine. Probably the worst part of all, when the hydraulic press brakes is manufactured, the extreme heat that is required will cause unavoidable ram movement that makes it very difficult to meet certain manufacturing specification guidelines. In order to prevent this from happening, mechanical builders have started to create hybrid electric press brakes. Using both electric and hydraulic mechanics, hybrid press brakes continue to employ hydraulic energy through the ram while only being powered for a small percentage of the time. On top of that, the hybrid model transports precise positioning that no longer has to depend on the machines’ valve activity for guidance. While there are various types of hybrid press brakes, the most frequently used of which are controlled by a motor that uses a covered cylinder that extends from a hydraulic receptacle. The cylinder is connected to a piston pump that it controls and brings hydraulic pressure to the different gears that operate the thick ball-screws. For newly invented electric only press brakes, there are specific electronic motors that are operated by ram movement that is also assisted by technically designed belt operated ball-screw prototypes. With a time activated belt system that circles the main pinion gear along with a gear that’s placed above the screw, the ball screw goes in and out of a large nut that is directly connected to the machines’ ram. Although this is the most common type of electric press brake, there are other designs that operate on pulleys that power the ram. By using this design, there is a pulley-chord that aligns with the ram which is wound continuously at a lower level than that of a ball screw design. Of course, there are many benefits that are associated with upgrading your press brake system. The biggest advantage is that both the hybrid and electric press brakes are more eco-friendly and more energy efficient. 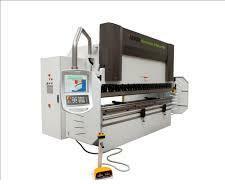 A press brake that is electric will phase out the use of hydraulic oil and can cut the energy expenses in half. Moreover, a hybrid uses about one-third the total oil that is required with a standard hydraulic brake. View our latest selection of new and use press brakes here.